GRITS! Yep, it's a totally southern dish but GRITS also stands for Girls Raised In The South! Ha! While it's historically been a breakfast food down here in the south, over the years, we've modified the traditional grits recipe to adapt it to the lunch and dinner table. Previously we added scrambled or fried eggs to it, or added crumbled bacon, browned ground meat or sausage to it or some people spooned sausage or red eyed gravy over it. 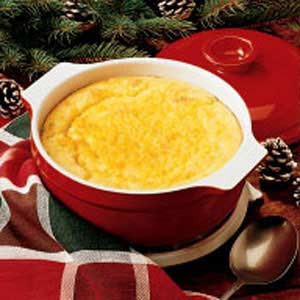 However, Southern Grits has finally grown up and made it as a special and beloved food on dinner tables and holiday menu's here in the south. No matter where you live in the contintental United States or abroad, if you can find grits, you can enjoy this satisfying, comforting and special side dish to grace your table be it breakfast, lunch or dinner. Enjoy this wonderful cheesy garlic version! **This is the original recipe from the early 1960's. Now with instant grits available, you can cook it according to the directions and add the cheese, garlic, butter and seasonings accordingly, to taste. I still make it the original way. Cook grits in the salted water. When cooked, add butter, garlic, cheese and worcestershire sauce. On low heat, combine well until butter and cheese are melted. Salt and pepper according to taste. This can be served as is or placed in a casserole dish, topped with more cheese and baked at 350 for 15 to 20 minutes. ***Note: Shrimp is a favorite addition to grits, particularly Garlic Cheese Grits. I simply steam some peeled shrimp in seasoned water, drain and add to the grits. To steam peeled shimp, place shrimp in a microwavable bowl, add enough water to cover, season with Tony's, salt, garlic powder. Stir and heat in microwave until cooked, about 8 minutes. Drain and add to grits.